Fangtastic Halloween Event. Spotlight, Giveaway and This OR That; Author David McAfee! When one of their own betrays them to follow a young rabbi from Galilee, the elders of the vampire race send Theron, a nine hundred year old assassin, to kill them both. I was initially drawn to this book by the cover, it is truly frightening! I was blown away by the content, McAfee’s style of writing grabs hold and pulls you in as he introduces you to his verision of Jerusalem in 33AD. Imagine True Blood meets Passion of The Christ, that is this book in a nutshell. These vampire’s do not sparkle and the sun will surely kill them. Vampires, mystery, blood and gore with just a touch of romance to soften the blow. The book is split into 4 main storylines but, I as...moreI was initially drawn to this book by the cover, it is truly frightening! 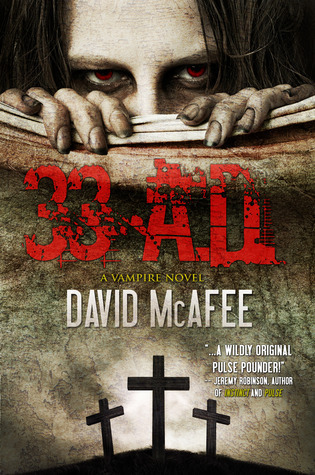 I was blown away by the content, McAfee’s style of writing grabs hold and pulls you in as he introduces you to his verision of Jerusalem in 33AD. Imagine True Blood meets Passion of The Christ, that is this book in a nutshell. These vampire’s do not sparkle and the sun will surely kill them. Vampires, mystery, blood and gore with just a touch of romance to soften the blow. The book is split into 4 main storylines but, I assure you, you will have no problems keeping up! Extremely interesting and unpredictable, the twists and turns will keep you engaged and on your toes. Hi Tammy. Well, as you know I just released a new book called OLD SINS, which is about a small town in east Tennessee that is haunted by the spirit of a young black kid who was lynched there in the 1970s. This book scares me, in more ways than one. Every book release is an excercise in anxiety. Will the readers like it? Will they get it? Will they hate it? Is this the book that finally proves to them that I am a worthless hack and they should be reading someone else work, instead? But OLD SINS is different. Some of the scenes are very graphic in both violence and language, so I am not sure how they will be received. Parts of the book detail the lynching of a 13 year old black kid by a group of drunken white racists, so you can imagine how ugly those scenes must be. My wife even made the comment that, while she enjoyed the book, she was going to have nightmares about that kid's death. I can relate, because I had nightmares about it, too. In fact, I was so worried about this book that it sat, untouched, on my hard drive for two and a half years after I wrote it, waiting for me to summon up the nerve to put it out. I considered toning the scenes down in terms of language and violence, but it just didn't feel right. I consulted with several friends and detailed my issues with the scenes and my proposed solution, and the replies were unanimous: don't do it. After some thought, I realized they were right, so I ran with it. OLD SINS is easily my most disturbing book to date, with luck, I won't lose any readers over it. My next release will be another collection of short stories. I am going to try very hard to have that out in time for Halloween, but I may not make it. I have just learned that my grandmother is very ill and may not be with us much longer, so I will be making a trip (perhaps several) out to see her in the near future. Needless to say I will probably not be getting much work done on those occasions. Additionally, I need to resume work on 79 A.D., which I have promised readers will be available by Christmas. Since the bachiyr are more important than the short stories, the new collection might be put off for that, too. This multifaceted Author also wrote an amazing zombie-esque book. If you want the bejezzus scared out of you, check out Nasty little F!#*ers! *Coke or Pepsi: Sweet Tea. :) When I drink soda, I prefer RC, anyway. *Summer or Winter: Summer. No contest. I prefer motorcycling, RC airplane flying, and bicycle riding to huddling in the house trying to stay warm. *Paper or Plastic: If you are talking about groceries, then plastic. If you are talking about finances, then I don't have enough of either. Please feel free to donate. *Football or Basketball: Football. Go Cowboys! *Hotdogs or Hamburgers: Hamburgers. Preferably on the grill. Another Summer favorite. Yum! *Facebook or Twitter: Facebook. It's too hard to be consistently witty and interesting in 140 characters or less. *Pen or Pencil: What does Word count as? *Movie or DVD: Both have their place. I love going to the movies, but we seldom get to these days. *Book or Ereader: I love my Kindle, I truly do, but I also still love paper books. Honestly, this one is so close I really can't call it. *Night or Day: Night. That's when I sleep. Sleep is good. And thank you David for your continued support of the blog, always graciously sharing your thoughts here for your fans and donating your books so we can grab you even more fans! We are ending our month long Halloween Fangtastic giveaway, Oktober event with a BANG! what a great way to end your month-long giveaways! i have only read two vampire series - Twilight Saga and Sookie Stackhouse and i would have to choose the latter as a favorite. thanks Tammy and thank you very David for being gracious! Sookie's. However, I am now a few books behind just because I needed a break from them after sooo many. Loved 33AD though! Great interview! I can't wait to read more of your books! I would have to say Jeaniene Frost's Night Huntress Series.I love me some Bones! :D Thank you for the giveaway. I love Blue Bloods. Thanks for the giveaway! My fave Vampire series will always be my first which is Twilight series. Thanks for this awesome giveaway Tam. This author sounds amazing and i can't wait to read his work! ok tams your rafflecopter thing is set up wrong on this one sweets!!!!! you can't like his facebook page...it isn't an option. you can follow his blogsite and friend him on facebook but you can't like him on there! so do we get credit for following his blog and friending him? I have 2 favorite's , The Black Dagger Brotherhood and The Midnight Breed. Thanks for the giveaway!! Twilight Saga - my favourite! wow, my favorite vampire series?!?!? your killing me, lol. i guess right now its a tie between the vampire chronicles by the ever so lovely anne rice, and the blood and light series by rue volley. i'm equally in love with both series. My favorite vampire series is The Vampire Academy and Bloodlines by Richelle Mead. I also like the Sookie Stackhouse series.